I popped along to the ICN gallery after work tonight to check out their latest exhibitions. Until Sunday 23rd September there are two exhibitions on, and I’ll share the details briefly here in two separate posts. First let’s start with Kouichi Okamoto. 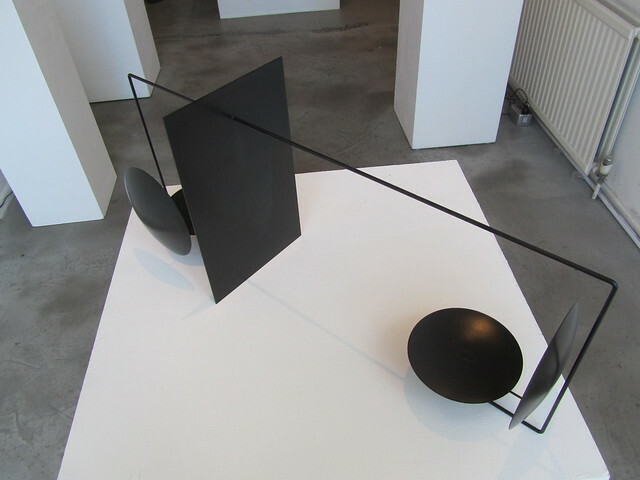 Kouichi Okamoto’s “form of the function” at the ICN gallery is one of two exhibitions the designer currently has on in London. The other, “Music Table”, is being held at the Victoria and Albert Museum Sackler Centre, also until Sunday. I haven’t been to the V&A, so I’ll just share a little bit of information about the designer and his work on display at the ICN. 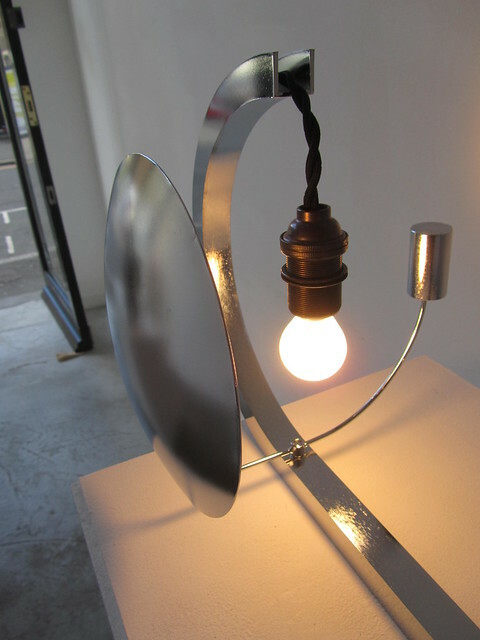 Part of the London Design Festival 2012, Kouichi Okamoto’s exhibition consists of minimalist design pieces that, personally, I don’t quite get. I think I would probably benefit from listening to the product designer speak about his work, because it’s quite hard to image the purpose of some of the pieces. I was quite taken with one piece though – The Random Musical Box, which appears in the window of the gallery, priced at £2,700. 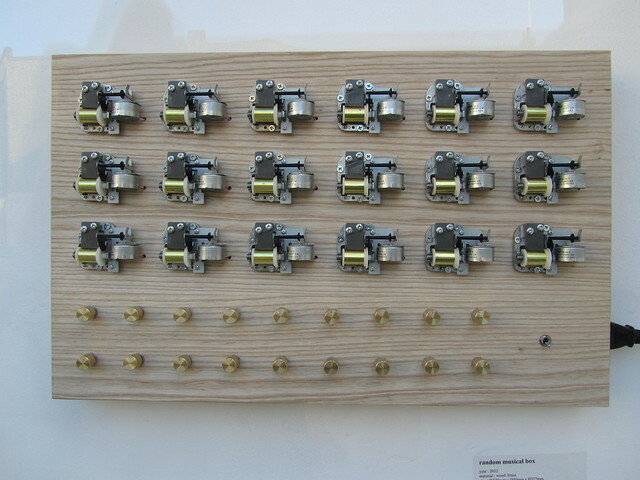 The Random Musical Box (below) consists of 18 musical box movements which play only one single sound. I didn’t see it in action, and I can’t quite imagine what it would do, but I’m intrigued. Okamoto actually used to be a musician (under the name “bekkou“) before he turned his hand to product design, so it’s interesting to see the ways in which he has worked music into his unique pieces. 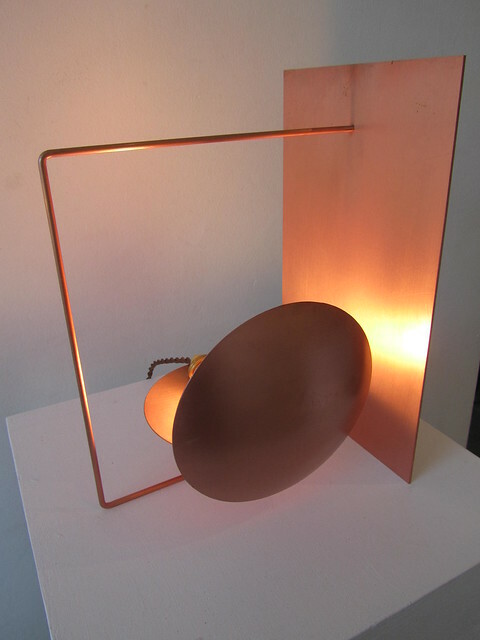 He also seems to have quite an interest in light, having designed pieces such as dish of light – “a dish for putting light”. Okamoto intentionally designs his products to be suitable for mass production and to be sold in design shops, rather than to be exhibited in museums as art pieces, but I can’t help wondering what kind of homes his pieces find their way into. I suppose some of the lamp-like pieces could work in a very minimalist home, but wouldn’t work for me. 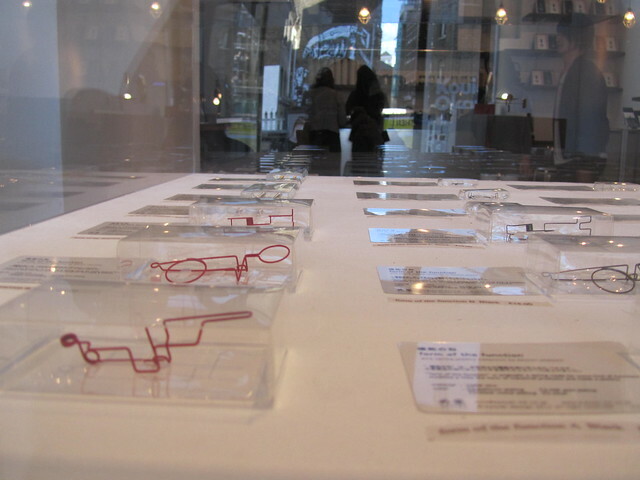 Kouichi Okamoto’s “form of the function” at the ICN gallery and “Music Table” at the V&A both run until Sunday. On Saturday 22nd and Sunday 23rd there will be live performances from the designer at the V&A from 4pm, and on Monday 24th he will be giving a talk at the Japan Foundation. For more information about the talk, please visit the Japan Foundation’s website, and for more information about the display at the V&A, please visit the V&A’s website. More information about the designer Kouichi Okamoto can be found on his website: kyouei-ltd.co.jp.